I think most of us like to think of ourselves as skeptical, or at least not gullible. It probably goes doubly so for me because I call myself a scientist. But I realized just in the last couple weeks that I was taking some financial advice at face value without considering the potential bias and motivation of the advisor! And I lost out on giving some advice to someone who likely has a more conflicted point of view than I do. I’m realizing that sometimes you need to pay for quality. You all know that I am a big fan of Ric Edelman, particularly his podcast. I’ve shared aspects of his views on personal finance several times on EPF. If you didn’t know, he is a fee-based financial advisor (own his own firm), which I do think puts him ahead of the Suze Ormans and Dave Ramseys of the world in terms of being connected to reality. He has a great guide on his website on 18 questions to ask a financial advisor. It really hits hard with the concept that you should only be taking financial advice from a fee-based or fee-only financial advisor (as opposed to one who charges commissions on products) and obviously makes the argument that you should use Ric Edelman’s firm or one very similar to it. As far as that goes, I think that’s a great resource because I agree that you should not be taking financial advice from a person who is making a commission from what they sell you. If you want someone to manage your assets for you, a fee-based financial advisor makes sense, and if you want to handle things yourself, you should see a fee-only financial planner. All of the questions in Ric’s guide to toward the concept of ‘consider the source.’ You want to be confident that your advisor is really acting in your best interest in addition to being competent. But in general I trust the advice that Ric gives, in no small part because of the fee structure of his firm. However, I have considered more carefully two aspects of his advice – mortgages and tax-advantaged retirement accounts. I have ‘considered the source’ when thinking about Ric’s advice once in the past, and this is one of the most common criticisms I see of one of his oft-promoted ideas: keep your mortgage forever and invest the difference. I explored this concept mathematically by putting a 30-year mortgage and a 15-year mortgage side-by-side. The idea is that your net worth will be higher at the end of a 30-year period if you take the longer mortgage and invest the difference in the payment. It works if the rate of return you get on your investments is similar to or higher than your mortgage interest rate, which is terribly obvious in the current climate and pretty reasonable most of the time. The math is strong enough on this point that I accept this advice of Ric’s even though it is quite unpopular and people do say that advisors who give this advice just want you to invest more with them so they make more money. Math-wise, there should be some fairly clear time of life when the traditional option should be superior to the Roth (the peak earning years), especially once retirement plans come into focus. Matt Becker also wrote a great argument for the traditional IRA to be strongly considered even for the young/lower-earning. There is also a harder-to-quantify argument for the traditional option: how certain are we that the Roth will be honored? I’ve heard Ric make an argument on his podcast that you should take the tax deduction now (the traditional) instead of having to hope that the X many Congresses between you and your withdrawals don’t change the law – basically that a bird in the hand is worth two in the bush in terms of knowing you’ll get that tax deduction. Having this latter realization has pushed me a little further toward, in the future, using a fee-only financial advisor (paying for expert advice) rather than an advisor who would manage my assets for me. I got worried for a second that there was some other grad student-turned-PF-enthusiast out there also giving seminars, but when I found the seminar listed on the group’s website I realized that it wasn’t really competition for me. The seminar is being given by a local financial advisor. I haven’t heard this person in particular speak before, but I’ve seen several professional financial advisors speak on various topics to a student audience, and not only is their approach is quite different from mine (it’s all about “when you get a job” and not what students can do right now), they have motivations and biases that are different. I imagine that when a full-time professional financial advisor volunteers to give a seminar to students, her motivation is a combination of desire to do community service and advertising to potential clients. The advertising could be direct, by hoping that some of these students actually become clients (this is supported by the evidence that the firm that hosted the last seminar I went to emailed me three times about a follow-up one-on-one session), or indirect, by making students feel comfortable with and positive about the idea of working with a financial advisor. So I guess how I feel about that advertising depends on how those advisors are paid, as covered above. Seeing the interest and engagement that the graduate students who showed up for these seminars had for personal finance be met with the (I hope) well-meaning but out-of-touch perspective of these professional advisors is what motivated me to create my seminar in the first place. I do not know as much as these professionals by any stretch of the imagination, but I know the grad student audience much more intimately than they do, and my presentation is tailored for them. I’ve lived it, I’ve studied it, and now I want to teach it. Now, for these first three seminars that I’m arranging to give, I’m doing it for free. But if they go well and I enjoy it, I may pursue trying to be paid to give variations of this seminar at other universities. That is for sure where the volunteering professionals have an advantage over me – they are free (up front). But I hope that the universities that I’m approaching can appreciate that my motivations and perspective are different and possibly less potentially damaging than those of the professional advisors. I think often it is better to pay for objective advice than to get biased advice for free! What is my motivation for giving my seminar? First and foremost, it is my desire to serve my grad student community on this topic. That’s why I’m doing this first set of seminars, for sure. I’ll also get some advertising for my websites out of it, though it’s hard to argue that this approach of reaching students tens-by-tens is efficient, so it is minor. 🙂 If I ever make any money from my websites I guess the advertising might be a heavier motivation, but that’s not really a factor for now. Of course, being paid to talk about this subject would be a motivation to do it later, but that fact doesn’t bias the information I present at all – if anything, it would give me more time to properly research and practice this craft. I think I need to find a way to communicate this to the universities I’ll be pitching without speaking too poorly of the professionals they may have gotten to speak in the past! 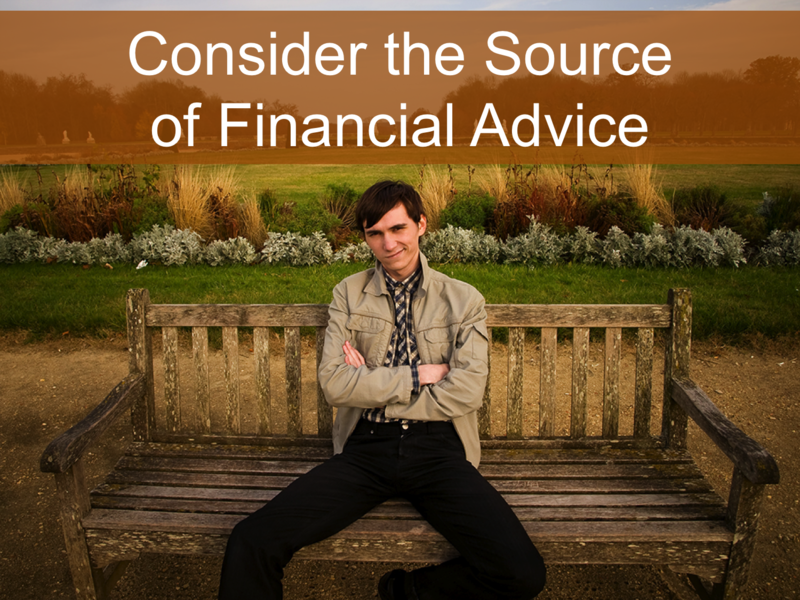 How carefully do you consider the source when you hear financial advice? Do you trust non-professionals or biased professionals more? What do you think about the long mortgage and traditional IRA options? The last time you did work for free, what do you expect to get from it? Does the Source of Gift Money Matter in Spending? 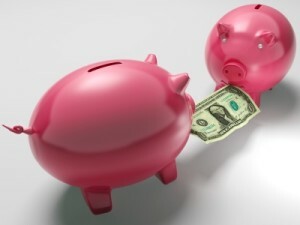 Will You Ever Reduce Your Retirement Contribution Rate? 6 Responses to "Consider the Source"
I’ve always been skeptical of advisors, so we just invest in the bank. Once our mortgage is paid off, we’ll likely switch to other lower fee banks and investment options. I think it’s important to acknowledge biases, but sometimes people with biases still give the best advice. So I think it’s best to learn as much as you can and ask a lot of questions. I hope since you are skeptical of advisors you are not seeing any advisors through your bank, because they are most likely salespeople rather than advisors! I think whether a biased person can give good advice, but if the advice is in the area of bias how would you be sure? I totally agree you should go into every situation with eyes open and ask all the necessary questions and more. This is great advice: Considering the source of the advice is a key. I’m sorry you’ve met some resistance — have you tried the Graduate Student Organization or the Campus Y? I’m planning to contact the grad student governments at all universities and perhaps some administrators of programs as well. I hadn’t heard of the Campus Y before. Why do you think it would be a good fit? Thanks for your input! I have read a book of Ric Edelman. I remember it was “The New Rules of Money”, which he explained some strategies for financial success. You may read it also Emily. The book is really great! That’s cool that you’ve gotten his opinion through one of his books. I’m working on The Lies about Money right now.